For me this was the big one. I’d scoped out one of the longest trails we’d tackle on the whole trip from the TransEnduro Satellite (or Google maps as they like to call it!) before we left and it looked to be a corker. 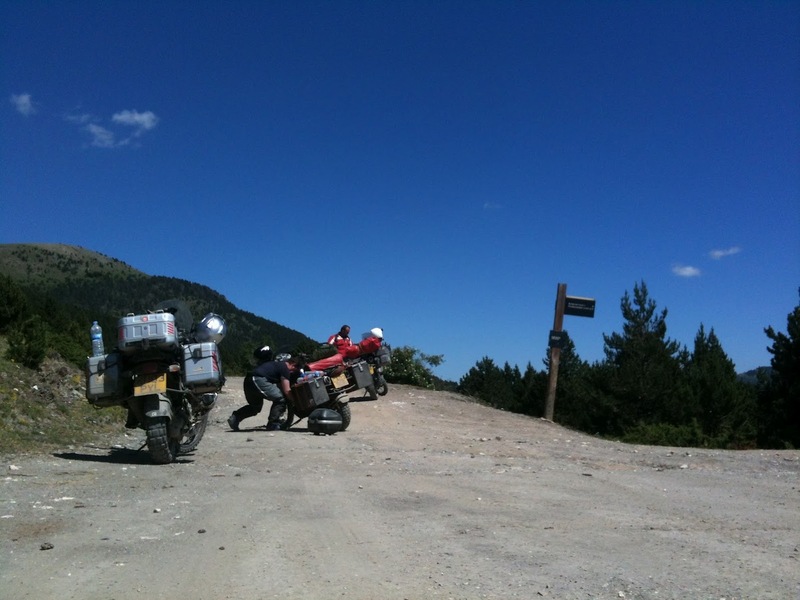 Hooking this one up and making all the right turns, that is to say the correct turns as opposed to just turning right, would provide us with the perfect liaison in to the Back Way to Andorra that we knew from Pyree Pyree 2010 and make it a day to remember. Getting it wrong would mess the day up in a big way. We were up and about fairly early, by our standards anyway. 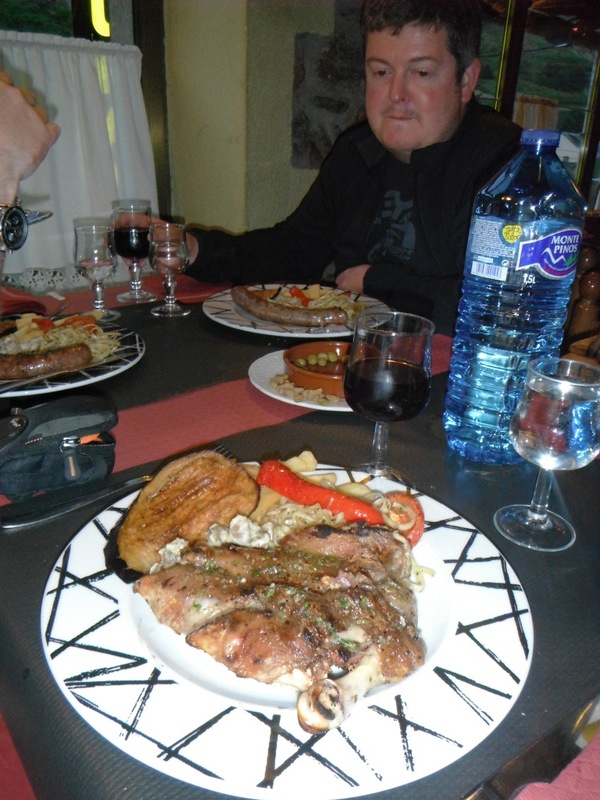 We’d enjoyed a lovely evening in the ski village of Espot and great meal at La Llupia. Simon and I had opted for the reasonably safe option of a local sausage whilst Steve had thrown caution to the wind and plumped for the Pigs Trotters. These were however no Caen Kako. Far from the meat-fest of the Normandy Pork Knuckle (a favourite at the Café Bois Charbon from previous trips ending in Caen) slow broiled in local cidre for 5 hours, I can only compare the trotters to the porcine equivalent of chicken wings. Maximum effort and minimum results – and Steve’s a man who likes his meat! However, he was happy with his choice, as much for taking the culinary “road less travelled” as for the few scraps of fatty pork he managed to scrape from the bony offering. He even managed to polish off Simon’s sausage…so to speak! I awoke to a raging back-ache. In spite of the promised comfort I thought the thick green grass of the campsite would afford me, I seemed to have pitched on the very crest of a mini hill, meaning that both my head and my feet were pointing downhill in opposite directions! I remember falling asleep with a slight feeling of being stretched, but woke to a feeling of having been bent over a barrel…backwards! However, a medicinal coffee and croissant, a couple of Vitamin N(urofen) and the promise of what I hoped would, for me at least, be the defining day of the trip soon banished the pain and, after settling up with the friendliest campsite owner we’ve ever had the pleasure to deal with, we were once again on our way. I’d chosen the campsite from several others in Espot as it sat at the foot of the road we needed to be on and it worked out perfectly. Turning out of the site we were straight in to a set of pristine tarmac twisties, climbing the mountain towards the ski area of Super-Espot. It was a short run up the hill of no more than 3 or 4 minutes before we hit the car parks beyond which lay the start of the trail. Snaking its way through the dense pine forest the trail was good and wide and we made quick progress up the the first of the lift stations. 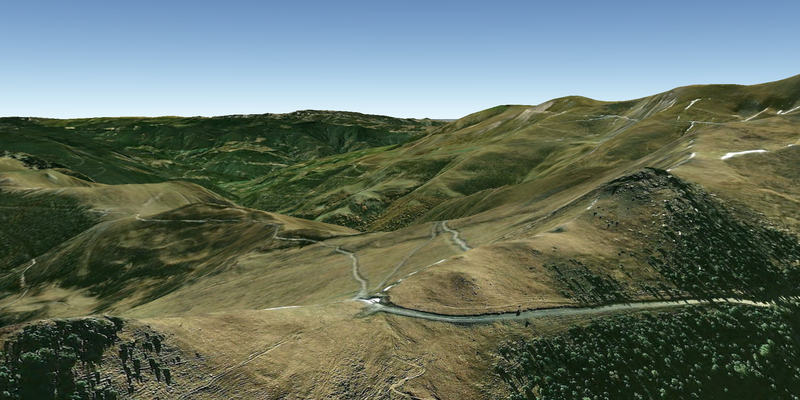 Above us on the slopes of the mountain we could see where the ski runs would be come the winter. At this point the trail split and, taking the uphill fork to the left, we quickly found ourselves cruising up what could only be a blue run complete with snow cannons! The trail switched back and forth, clinging to the mountainside as it carried us higher and higher and eventually to the summit. I’d studied this point from every angle on Google Earth to make sure that the trail we took would actually lead us somewhere and I knew the view would be something special but, even prepared as I was, the epic vista was simply breathtaking. Directly ahead a narrow and dusty looking trail snaked off towards the horizon whilst to our right another trail, our trail, traversed the entire mountain range winding its way into the far distance. Apart from these two trails there was nothing man made as far as the eye could see. This was it! Tucked away around the next corner was a little 2 storey mountain refuge. Far from the immaculate and welcoming refuge above Longas, this one was in poor order, had a stinky cow shed downstairs, a grubby graffiti-ridden main room and a small sleeping room with manky looking bunk beds upstairs. I’d have to be in all sorts of bother to want to spend the night there in spite of the jaw-dropping scenery outside. Moving on, the trail sliced into the mountainside was in good condition and we made rapid progress along the traverse. Every time we rounded a corner we were met with more and more stunning views. Approaching one bend, a huge vulture or eagle swooped around the corner towards us, hugging the mountainside until we passed almost eyeball to eyeball! After a bit of map consultation, we eventually took a left fork in the trail which immediately started to descend the mountain in a series of rocky rutted and gnarly switchbacks. We stopped to take on water and take some pics at a little shepherds hut on the mountainside before carrying on our way downhill. I immediately parked up the GS, easier said than done on a steep, narrow and rocky downwards slope and started walking back up the trail. With every few metres we had descended the temperature had risen and risen. From the refreshing cool of the high mountains earlier it was now absolutely baking. It took me a good few breathless and sweaty minutes to reach Simon and Steve by which time, at first glance at least, everything looked fairly normal. Descending the slope, I had strayed slightly too close to the left side of the trail and my pannier had just ever so slightly grazed a large rock poking out from the steep bank as I passed – almost repeating my expensive faux pas from the Surrey Shakedown Run. It appeared Simon hadn’t been quite so lucky though. 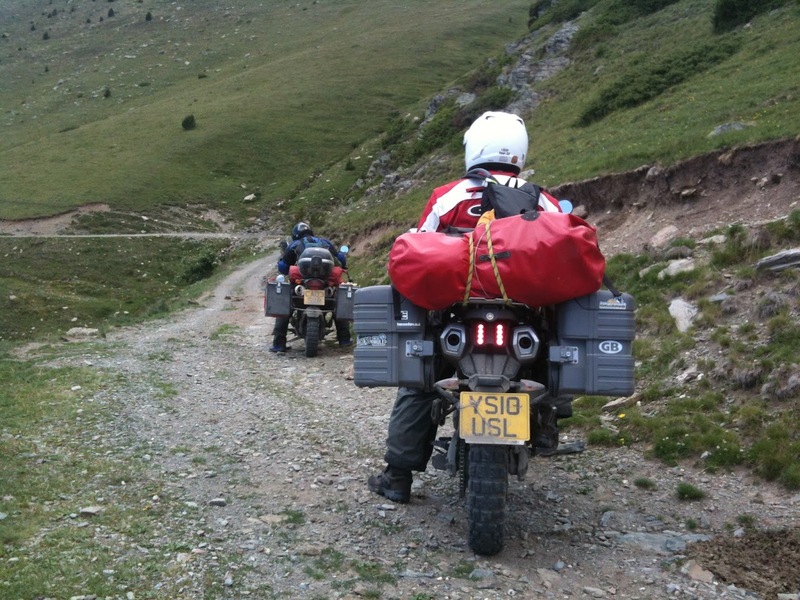 Taking the same downhill line as me, the previously immaculate left hand 41litre Touratech pannier on his BMW F650 had properly connected with the lurking rock. Normally a pannier taking a whack like that would dislodge itself from the pannier rack, however as the mountings were a little “shaky” to say the least and after a pannier dropping off earlier in the trip Simon had strapped both boxes on to make sure they stayed in place over the rough ground of the trails. This resulted in the bike being knocked violently off course, gravity taking over and coming down hard, flat on the other side and making a bit of a mess of both panniers in one fell swoop. Not to mention spitting Simon off, perilously close to the large drop at the edge of the trail! 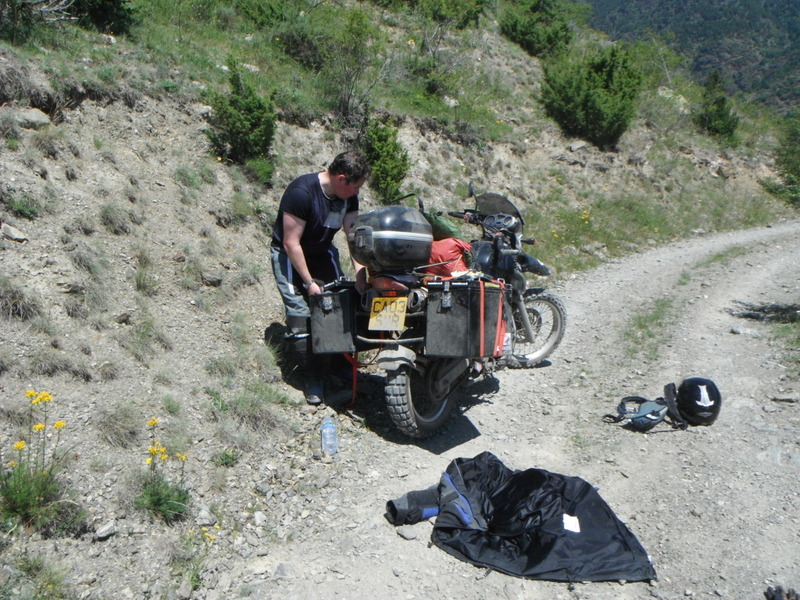 Now, we were in the middle of nowhere, so it was all hands to the pump to get the bike upright again, get the boxes reattached, plonk Simon back on top and carry on down the mountain and back to civilisation where we could take a breather, re assess the situation and deal with it as necessary. Half an hour later the trail emptied us out in the tiniest of mountain villages and, after a further 20 minutes or so of twisting tarmac we arrived at the main road through Rialp. We found a bar and got some much needed fluids down us – it had taken a good 3 hours or more to make the “up and over” from Espot so we were all ready for a break. However, we still had a long afternoon ahead of us with the start of the trail leading us back up into the mountains and over the border into Andorra just a few miles up the road. After cleaning out the entire stock of small sandwiches (three) the bar had to offer and a quick status check on Simons strapped on panniers we were back on our way. Turning off the main road it was familiar going, wending our way back up into the mountains through the increasingly tiny villages of Tirvia, Ferrara and Burg until the turn onto the trail to Andorra opened up before us. It seemed easier going than before, a little less rough than I remember from 2010 and we made good progress, scooting up to the cross roads of trails on the false summit – the start of our problems on this route the last time. Hindsight is, as they say, 20/20 and this was one fork in the road that neither Steve or I would forget. The broken sign was still there…and still broken! I wonder how many other unfortunate explorers had mistakenly gone right instead of left and ended up in the “Meadow of Death”! A quick hydration break and a spot of pannier strap adjustment later we were off. From this point the trail traverses the mountain at a fairly constant altitude making for a good flat run interrupted only by a few groups of wild ponies blocking the track. After a sharp left turn the track began to drop down into another valley. Two thirds of the way down I began to hear the rumble of an engine closing up behind me…blimey, Simon’s getting a bit too close again I thought! Snatching a quick glance over my shoulder I caught a glimpse of a red and white jacket and for a second thought it was Steve who had closed right up behind me before the rider shot past atop an old Yamaha XT600. He was really giving it some beans, the back wheel bouncing from side to side and rock to rock, clearly having lots of fun on a lightweight bike un-emcumbered by 2 weeks worth of luggage as we were! 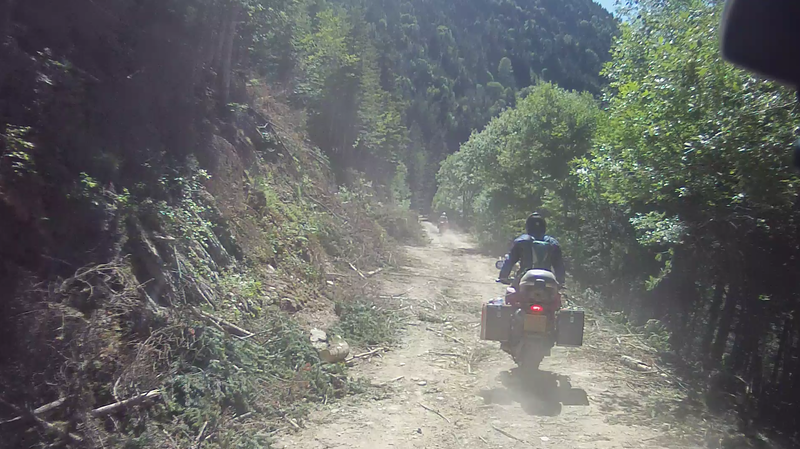 Moments later 3 KTM’s shot past in rapid succession and disappeared through the trees in dusty orange blur. 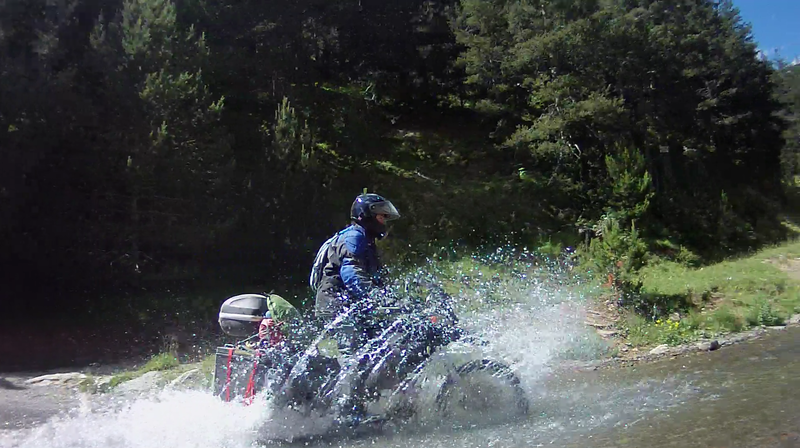 The trail began to flatten out as we reached the bottom the valley, I knew what this meant…River Crossing! In 2010 Steve and I had ridden the route “blind”, that is to say without any prior knowledge of how tough the going would be, so you cross any bridge as and when you come to it. Well, if there’s no bridge to cross you have to go through the water. First time around I had dutifully stopped, got off and walked through the knee-deep water checking the depth and scoping out the best path across the rocky riverbed. 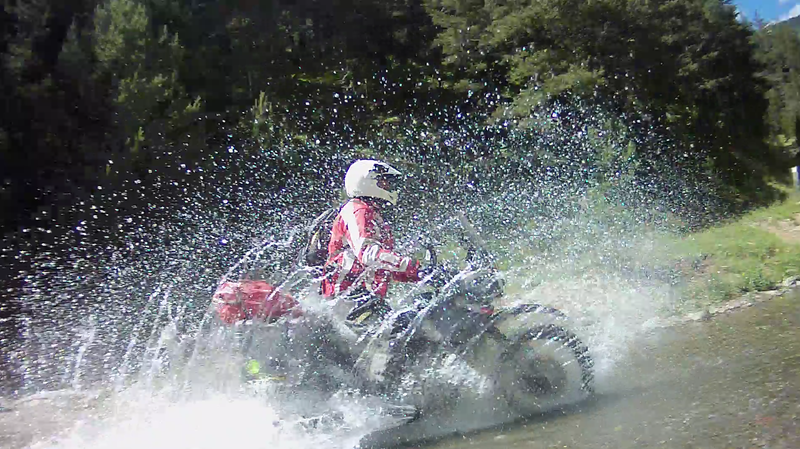 It’s not particularly wide, but ploughing through running water on a bike is always great fun! This time around however the last of the 4 dirtbikes that had overtaken us was just going across and the guy from the XT was standing just down stream below a small waterfall taking pictures of his party making the crossing. This was no time to get off and walk the course so I opened the throttle and ploughed my way through…much to everyone’s surprise! Simon and Steve arrived and followed me across and we had a good chat with the other riders. 2 guys and 2 girls from Holland, they’d driven down with the bikes in the back of a van and were staying at a friends hotel in nearby Andorra. 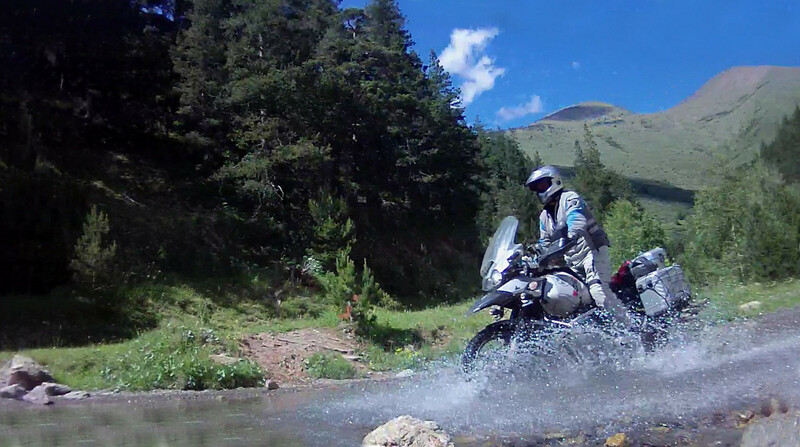 The leader, the guy on the XT said he’d ridden the trail a couple of years before on his BMW GS 1150 too so understood my challenge! Very heavy we agreed, but lots of torque…the torque will save you! Very true, very true. 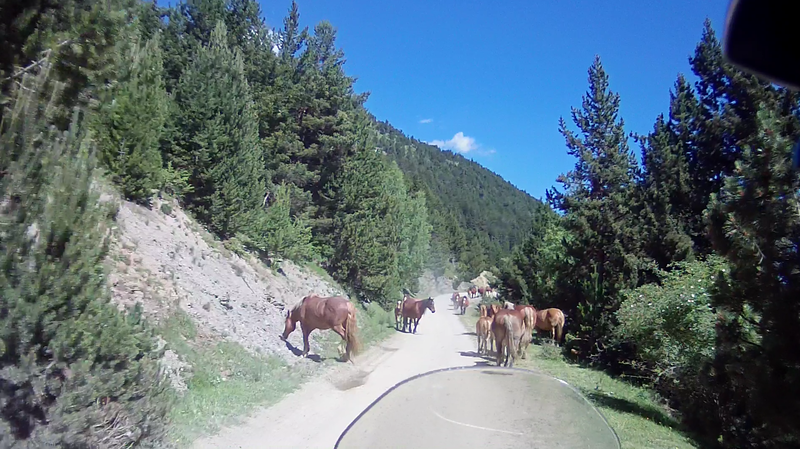 We said our goodbyes and they set off ahead of us to work their way back up the mountain and over in to Andorra and we followed shortly behind. Well, not before we all rode through the river a few more times for the camera! It wasn’t long before we came upon the “abandoned village” – a group of around half a dozen or so stone buildings high in the mountains, really in the middle of nowhere, that appear to be largely abandoned. Or so I always thought. Crossing the small stream, passing through the narrow “street” and up the steep incline out of the village I glanced back and there were what appear to be new additions of solar panels on a couple of the roofs of the buildings. Perhaps not so abandoned as I thought. We wound our way up and up and up again, through another new addition of what seemed to be a swing gate in an electric fence across the trail and further up to yet another summit, just as the Dutch guys were setting off on the run back down the other side. 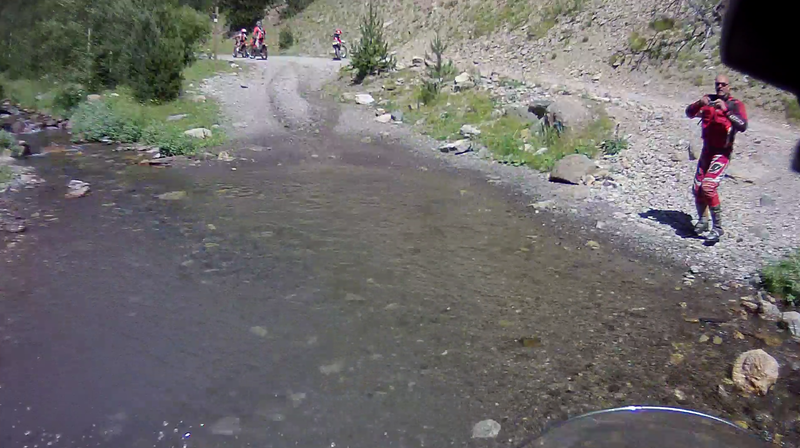 We had another fluid break and then followed them down towards Andorra. further down the trail there was some logging in progress and the dusty track was strewn with boughs and branches from the pine trees – puncture alley we thought! 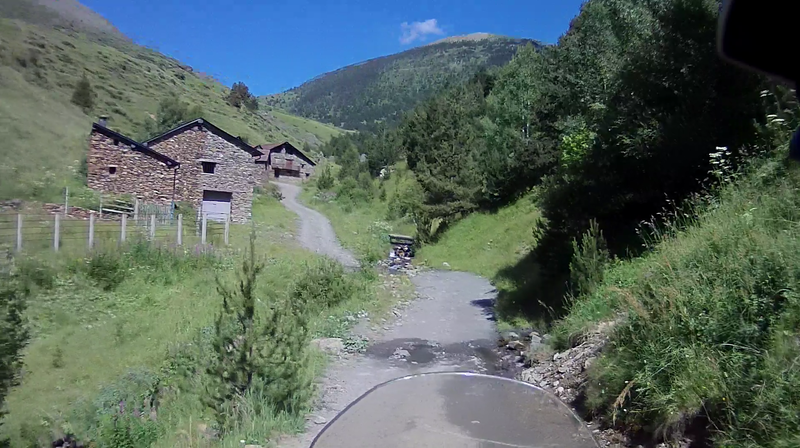 However, our TKC80’s didn’t miss a beat, admirably fending off any intruding splinters, and we quickly arrived at the end of the trail and the start of another fantastic rollercoaster road down a narrow gorge and eventually back in to civilisation in Andorra. Well, I say civilisation, maybe I should say endless roadworks and heavy traffic! We headed for a campsite south of Andorra La Vella only to arrive and find it was literally a building site! A few prods of the TomTom revealed another site a few miles back up to the North so off we went…only to find THAT was a building site too. A third site thrown up by the sat-nav turned out to be non existent until, an irritating hour or so later, we eventually found camp right by the football stadium in Andorra La Vella itself. We threw the tents up in double time and set about stripping the damaged boxes off Simon’s BMW to assess properly the day’s damage. The boxes themselves had taken a bit of a beating. 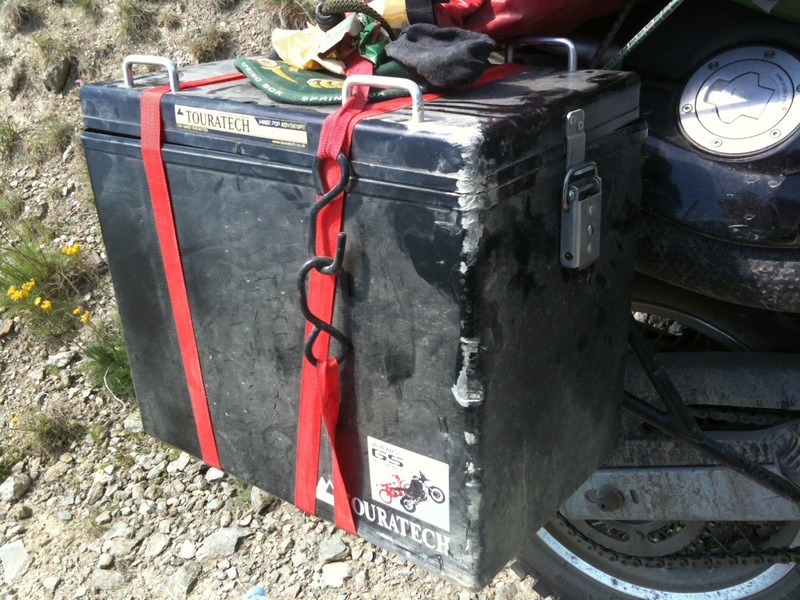 The left box was heavily dented from the initial contact with the rock and the lid had bent and popped open, whilst the right box had taken the weight of the bike as it fell so was a little squashed and bore some impressive battle scars from the rocky trail. However, it was the pannier frames that had taken the worst beating. Both sides were bent to the extent where the lower mounting points would no longer connect with the matching point on the bike. No amount of straining and pulling would allow us to get them realigned. So out came the cable ties and we fixed the frames firmly to the rear pillion pegs, finishing off with a good wrapping of Lock-Wire for extra hold. In the end, it was a more solid setup than it had been on Day 1! Simon took Steve’s hammer and did a great job of “panel beating” the boxes back into shape and by the end of it they didn’t look too bad at all, just a couple of well earned battle scars! We had word from Dave that he’d test-ridden the Tenéré into Pamplona (40km or so from where we’d left him and where he still was right back at Camp 1) and had seen the end of the Bull Run. Not only that but he’d witnessed a goring and had seen blood! By all accounts it was a bit of free-for-all nightmare from the little he could see. I’d still like to do it though, but I’d want to be considerably fitter before trying it!